I don’t like our society’s obsession with losing weight. Measuring our health by measuring our pounds on the scale has led our culture in the wrong direction. You can eat processed, calorie restrictive “health foods”, over-exercise to the point that you are catabolizing your muscle tissue, and feel bad and hungry all the time, but if you’re losing weight, that’s okay. As a matter of fact, if you’re losing weight, you’re healthy. This may come as a little bit of a surprise, but just because you lose weight on the scale it does NOT mean that you are healthy. There are many poor states of human health that come coupled with a loss of weight on the scale. And on the other side, just because your weight is higher than you may want it to be, it does not mean that you are UN-healthy. This whole weight loss thing is really relative and (more or less) confusing to the average person who just wants to look good in a bathing suit. And with the way that the media has programmed our opinions of our bodies, there are only like 5 people in the entire world who actually look good in a bathing suit. I love hearing people say that they want to be healthy. I love hearing people say that they want to take care of their body and treat their body with respect. I love hearing people say that they’ve decided to put a priority on their health, eat real foods, and move their body on a regular basis because they love it. I know those people will be more successful because not one time did they mention weight. They are devoted to doing the things that, chances are, will result in an elimination of excess weight. If health is the goal, then necessary weight loss can happen as a side-effect. If weight loss is the goal, then health can happen, but struggle and sickness can happen as well. You can lose track of what matters most, cut corners, and end up far worse than when you started off. 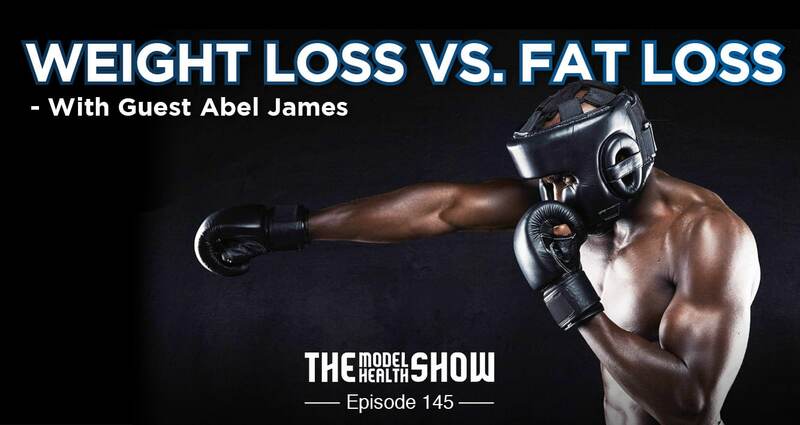 We have on the author of the New York Times bestselling book The Wild Diet, Abel James, to discuss weight loss vs. fat loss, how to support sustainable weight loss if that’s still your goal, and how to go about changing your body in a smart way that really lasts. This is information that everyone in our society today needs to know, so just click play, enjoy, and make sure to share with the people you care about! Why Abel decided to do a major television show (even though it seems counterintuitive for his brand). What’s going on behind the scenes of major weight loss shows. The shocking cost of medical bills that Abel’s client on the show incurred before starting The Wild Diet. Why weight loss television shows are making a mistake in their tracking. Why health and happiness are often separated from each other in our society today. How muscle loss can slow your metabolism. What Abel’s client Kurt did to lose 87 pounds and more than 22 percent of his body fat during the competition. The special dietary fats that Kurt focused on to give him an edge in weight loss and his health. How people can lose a lot of weight on the scale but not lose a lot of fat. Why excess skin can be a big challenge after an extreme weight loss. Why bone broth could be valuable for your health practice. How making a fool out of yourself can actually help someone else to have a breakthrough in their health (this is powerful! ).